Television was invented in 1925 by a 21 year old Scottish inventor named John Logie Baird. As with most technologies, it was spatialized, little known and not very user friendly. Other inventive types made moves to increase the user friendliness of Baird's inventions, but big business has yet to build a business model around the tech. Industry pundits are doubtful of the market opportunities of such a device, but it spread regardless. Twenty years after the introduction of the technology, RCA corp. takes the technology into mass production. This is the point at which the content creators and distributors started to ramp up. Studios to create content for this new "visual radio" format and distribution networks in the form of TV broadcasters started forming. All content was distributed through the airwaves via antennas. Despite incremental changes in business practices, the business model of the TV content creators and distributors (often vertically integrated as one) had not changed from the 1940s to 1970s... Basically, an ad-driven revenue model (TV commercials). Despite a rather stagnant business model on the content distribution end, the receiver technology did progress and advance. Cathode ray tube televisions provided clearer pictures and color images. The advent of coaxial cable allowed for greater, uninterrupted bandwidth, meaning less terrestrial interference and more reliability (think aluminum foil on metal TV antenna sticks, snow on the screens and wavy pictures when it rained or snowed). With coaxial cable came a new, unique business model - cable television. This model relied on monthly subscription revenue in lieu of advertisements. It provided higher margins, in large part due to the high upfront capital costs of laying the cable in the ground (or air via poles) and capital-intensive servicing. Roughly ten years later, the satellite TV industry emerged. It ran along a similar subscription fee business model, but boasted theoretically better margins for there was only one large upfront cost (launching or buying access to the orbital satellite which beams content down to terrestrial receivers in homes). This allowed greater reach with less capital outlay for the less densely populated areas. Meanwhile, in the homes, receiver technology advanced much faster. Televisions with plasma displays arrived, allowing for the relatively bulky cathode ray tube TVs to be replaced with slim panels whose images are formed by energized plasma gas in the late 1990s and early 2000s. Plasma TVs then gave way to LCDs (liquid crystal diodes) which allowed for higher resolutions about 10 years later. 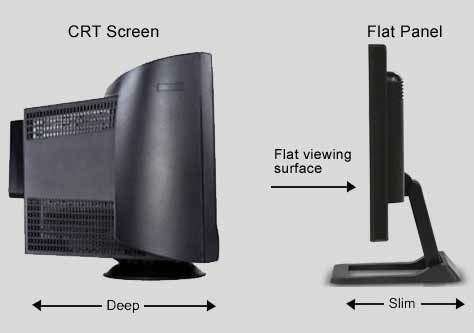 Plasma and LCD TVs (flat panel devices) introduced the era of HD (high definition) television in which the images approach reality in terms of resolution (at least when compared to CRTs). At the same time, the Internet and its' interlinking overlay, the World Wide Web, became popularized and startups introduced the concept of streamed and downloadable video content through the "cloud". Examples were YouTube, Amazon and Netflix. The advent of video streaming caught on much faster than both the established video content creators and distributors, as well as the reception device manufacturers thought possible Their slow to react response times made room for an entirely new business and business model, for receiver manufacturing companies as well creators and distributors. This is what the most used receiver tech looks like now - a far cry from what the industry was used to for the previous 90 years. Ironically, the 2nd most popular receiver manufacturer is a computer company - Apple. 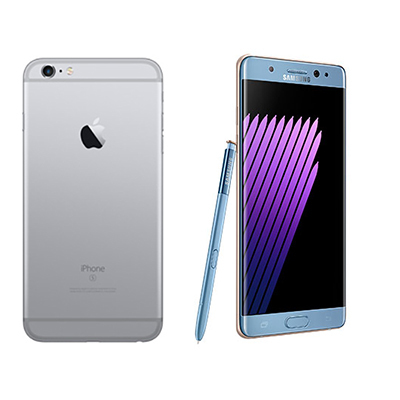 Smart phones now outnumber computers and traditional TVs in both sales and presence in the home and business. 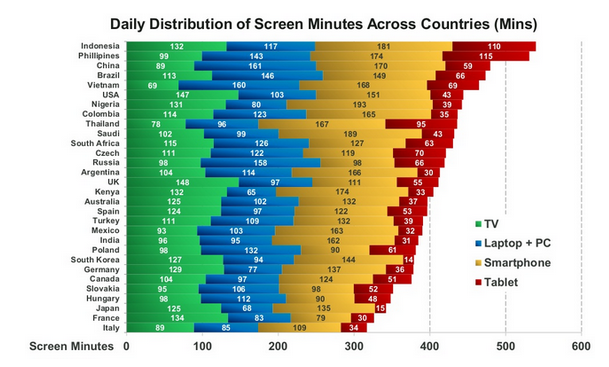 It has also transformed the way content is consumed, worldwide. Throughout the 50s, 60's 70's, 80's and 90s television consumption was often an group or family led past time, due mostly to the expense of the devices, immobility and linear nature of the programming, ie. your favorite show comes on at 8pm on Wednesday. In order to see it live (or before VCRs and DVRs, to see it at all, you had to be in front of the TV at that time. Now, the new streaming services allow "on demand" access and all you can eat, personalized consumption on very portable devices that can fit in your pocket. As a result, the behavior of the demographics, as well as the demographics themselves, have changed dramatically. The most popular manufacturer is not even an American company. One South Korean company, Samsung, was able to capitalize on both the legacy and the paradigm shifted receiver technology. They manufacture the screens for the two most popular handheld devices, and the high end screens for the traditional home device, the flat screen TV. As a result of their prominence, they have led the way in integrating Internet and WWW aspects into the TV experience regardless of form factor. Leading edge companies such as Samsung are now pushing the boundaries of resolution, with 8k large screen TVs that were once the purview of commercial movie theaters at consumer prices. What was bleeding edge tech costing $10,000 just a few years ago (HD and 4k Ultra HD) are now available on relatively inexpensive $100 to $700 phones that fit in your pocket and are carried around by about 80% of middle school-aged children, complete with full video content production, consumption and real time transmission and broadcasting capabilities. Reality, picture quality and resolution are are culminating in the newest crop of OLED (organic, light emitting diode) screens which give better than photorealistic quality. This level and quality of presentation is now available through real time streaming to any device, regardless of form factor. As a matter of fact, the Samsung phones have had advanced versions of OLED, (super AMOLED) screens for over 4 years now..
All paying subscribers can click here to access the analysis of the various content producers and distributors to see how things are changing, who's benefitting from the change and whose losing out. Click here to subscribe. Now, on to Subscriber Level Overview of the Transformation of the TV Content Industry.